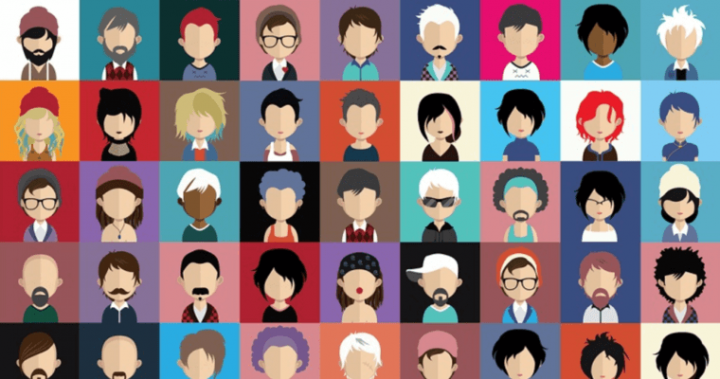 Do you love user personas? Turns out, not everyone is a fan. 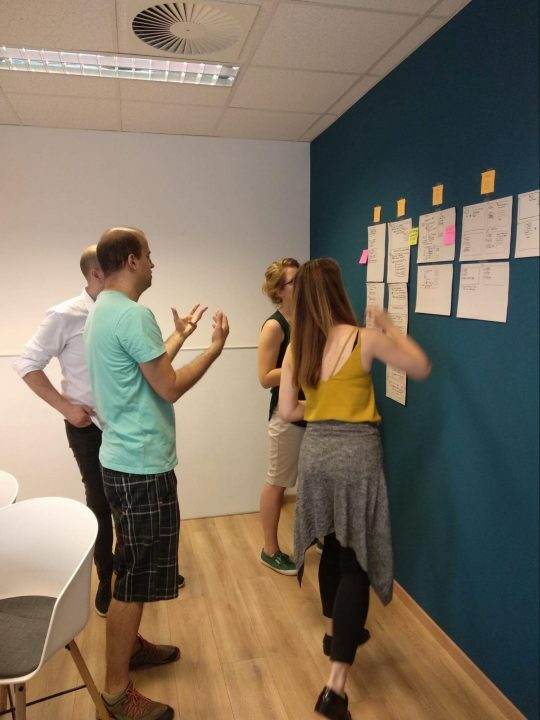 At UX studio, we recently had a great conversation about user persona creation which showed us that most designers and researchers have their doubts. We still think personas have proven themselves a necessary technique, but where does the controversy come from and how can we create good ones? 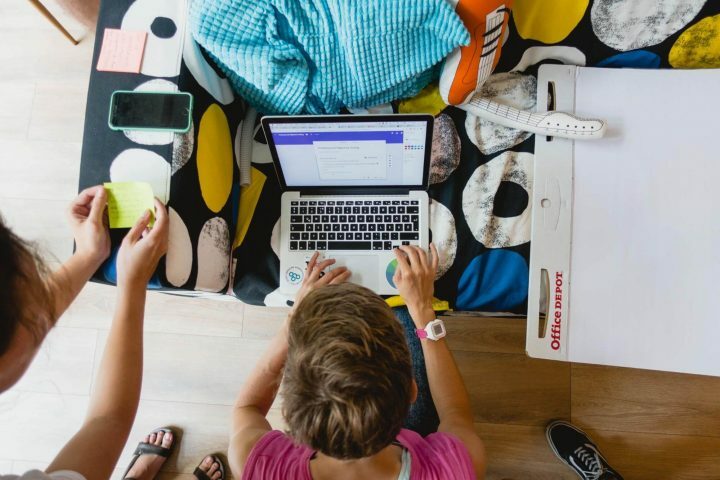 This blog post has been written to discover the pitfalls of user personas and how to avoid them. We are also writing about how we create them to provide you some tips along the way. 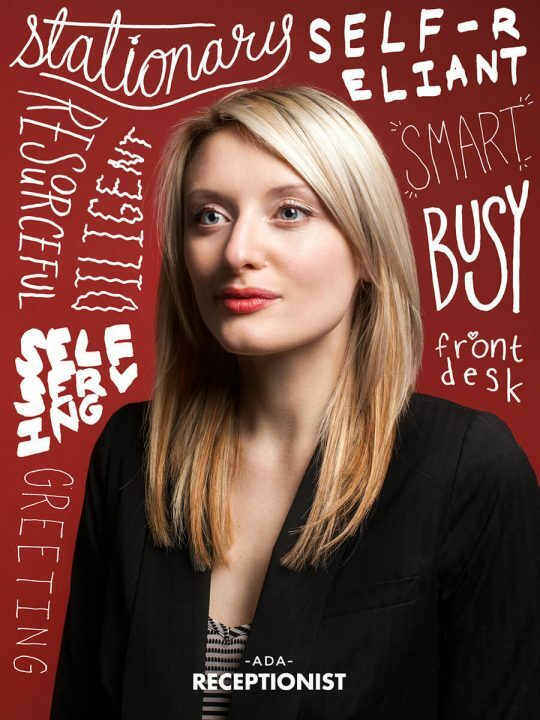 What makes a user persona? Why are they important? What pitfalls do they have? How do we create valid user personas? OK, from the beginning: Feel free to skip ahead if these paragraphs cover basic knowledge you already have. User personas in UX design essentially represent the different kinds of people you design for, the end users. Creating user personas introduces you to these different segments. It lets you finally map the necessary context, problems and motivations the potential users have. What kind of gadgets do they use and how? Do they have previous knowledge about the product? In what context do they use the product? What are their motivations? Why would they use the product? At UX Studio, we make user personas through workshops. During them, we focus mainly on the last two groups of questions, the persona’s behavior and the relationship to the product. What don’t people like about user personas? No matter how useful getting to know your users and future customers, turns out, many UX designers and researchers take their personas with a grain of salt. Why? Without enough research material, you might end up with misleading user personas. Even worse, you could stick with a hypothetical persona built on assumptions. Not only do you keep learning about your personas, but they also change as they use the product. User personas can prove not as simple as they seem. Saying at the beginning of a design process, “OK, these, my personas, won’t change and that’s that,” holds risks. But very tempting ones. Another pitfall of user personas: We can very easily imagine them into something inaccurate. Many persona templates include only the most basic characteristics. We might supplement the personality with made-up factors to make it whole. Alternative techniques can describe user behaviour. After discovering the product’s details, consider taking another direction. A jobs-to-be-done process focuses on user motivation. We could go with an ethical design workshop. We commonly conclude that they do not necessarily work as substitutes for user persona creation. But they can serve as a great tool when taking other approaches to get to know your users. So no matter their faults, user personas still apply. Thus, we decided to collect ideas on how to use them well. Why do user personas still prove important? We think user personas still matter despite their imperfections. We cannot question the importance of getting to know potential users as well-defined users. Of course, other methods also let you get to know them. But we probably use well-defined user personas most commonly and for a good reason! 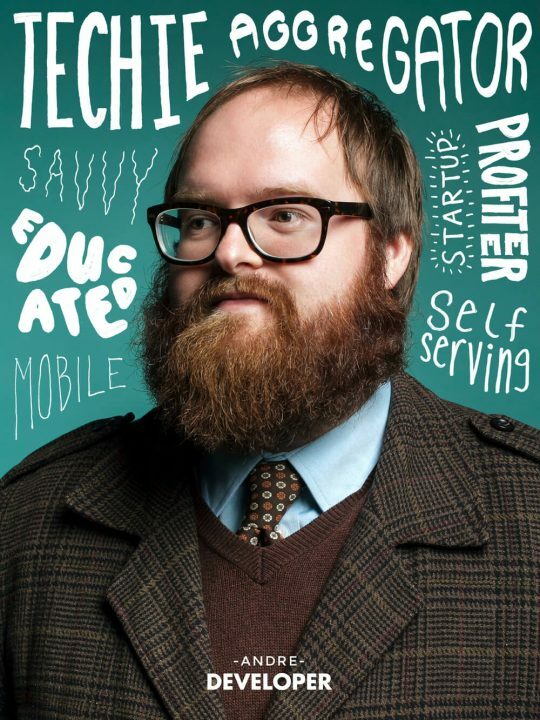 Think about your personas in UX design! On one hand, user personas prove essential to get the product team on the same page. The UX designer might not work in-house with the product developer and has not worked with the same product for years. Then the designer does not know the customer segments. When the team develops the personas together and agrees on the characteristics, they start their cooperation with a clear vision of the potential customer. On the other hand, it helps the designer later in the UX design process to imagine the user in a more tangible way. Exactly mapping user behaviour resembles getting to know a real person. If you know the person, you can better imagine their problems and pain points, and possibly create better solutions for them. At UX Studio, all designers and researchers work on different products. This definitely has its advantages, such as keeping our points of view fresh and providing challenges. But this also means that every product design process needs to start by getting to know the product and the field we are going to work with. To ensure a full picture before creating the personas, we get together with the product team. As a warm-up, it usually involves getting the team’s point of view about the customers’ typical pain points and problems. Since we only discuss issues at this point, we don’t always have to go through all the details, such as demographics. But the typical issues can give a better sense of the customer segments. 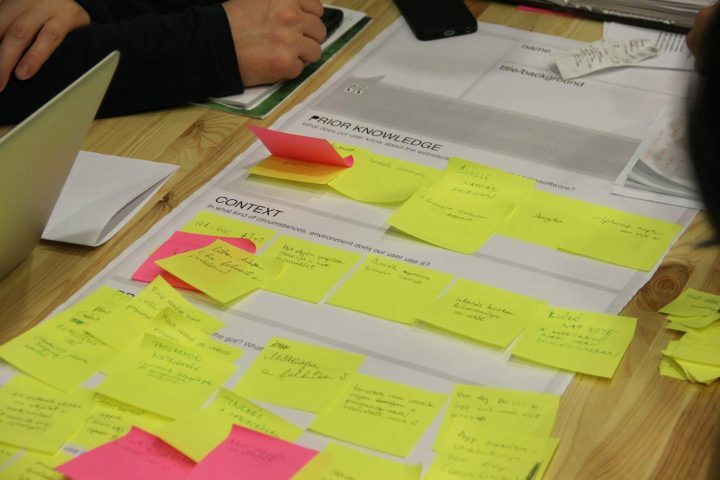 After getting to know the potential users’ pain points, we create user persona prototypes based on impressions. Note that as an outcome here, we’ll have a user persona mock-up, not the final thing. We got the whole product team together for a persona workshop! 2. Verify your theoretical user personas with research! We base the above user persona prototypes on impressions, so they may not wind up correct at all. To make sure we are designing for real people, we need research. We have several methods to choose from, both qualitative and quantitative. But what kind? 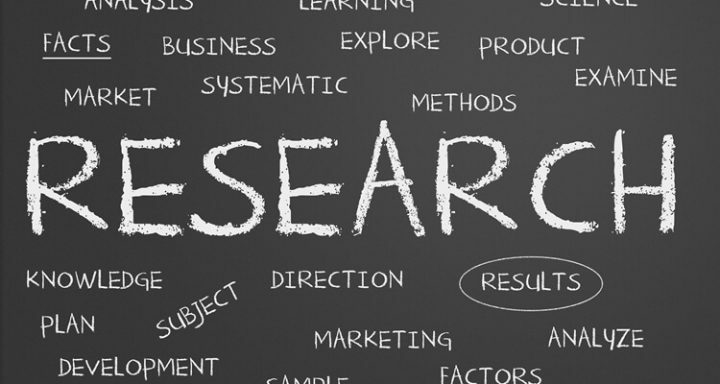 As a first step, check out existing research you already have, perhaps a survey a research agency has done or insider information the stakeholder provided. If you have research at hand that maps out the potential market and shows real segments, go for it! Of course we always check its validity. If you don’t have existing research, then do some! Verifying the theoretical user personas needs doing. People most commonly use user interviews. They can point out the personal characteristics of potential users. The challenge lies in figuring out how many interviews you need to back up your initial impressions. Valid personas = research, research, research! Okay, research forms a crucial step. But only good research, right? Our researchers at UX Studio always keep these tips in mind during research. You not only need to know the product and the potential market to make a good design, but the same applies to the basics of good research. Based on that knowledge, you can figure out its goal, even just to “find segments in a certain field”. The more specific you make it, the easier it makes your job. Get your sample from real potential users but make sure you have enough. Our researchers recommend at least ten interviews in case of persona interviews. Of course, everything depends on the product and your resources. Defining segments can prove hard, especially after having done lots of interviews and not really knowing what to do about all the information. We like to extract the most important information of an interview into an Excel sheet. Not in a quantitative way, of course. It mostly involves taking notes about the backgrounds, pain points and motivations, and then highlighting the most relevant. This instantly helps show the interview results more clearly and move the process of creating segments and user personas along. 4. Create the “real” personas! Finally, we have all the needed information and possibly some ideas about the personas. 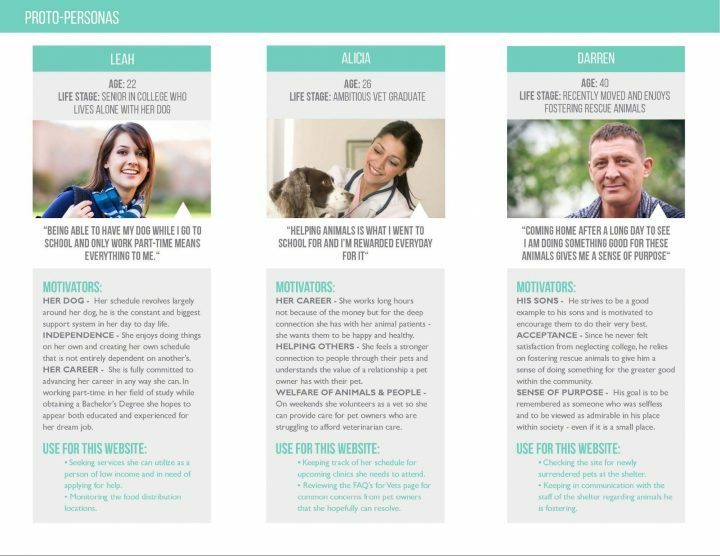 We recommend using a template to actually describe the personas. This makes it easy to distinguish them, as you will know the same set of characteristics about each one. Download the template we use here. 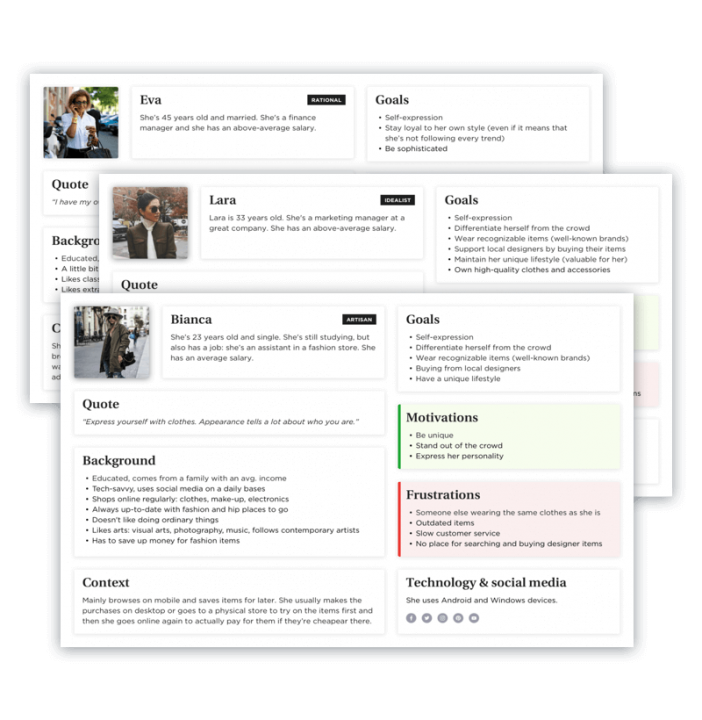 Our template paints a picture of the personas with the following four factors: prior knowledge, context, problems, motivations. Prior knowledge describes what the persona knows about the product or product category. Professionals or experts will need less education during the onboarding process. Hobbyists and those who have never used such applications will need extra information to keep in mind all through the design process. Context means the environment, time and place people will use the product in. A noisy train or quiet library? Will the user have much time to comprehend all the features or will the product rely on its speed? It all influences the kind of design and features needed in the product. The problem takes the form of an easily described tangible issue. Thinking about social media, it involves wanting to communicate with friends more often or knowing more about them. The motivation, the reason why the user wants to solve the above problem, comes from a deeper, more personal level. The core motivations, the reasons, usually require a higher level of knowledge about the user and real insights into the user’s mind. Create 3 to 5 user personas! We usually end up with three to five personas related to a product or topic. During our work on Société, we created three. Two personas usually don’t suffice, as they do not give enough depth about the target group. More than five sets something off. At that point, rethink the segmentation method. Maybe categorize them based on their attitudes, not profession, etc. We strongly recommend this step because six personas means six different sets of characteristics everyone needs to keep in mind throughout the design process… Too many! At the end, check yo’self before you wreck yo’self. Or your user personas. Seriously, in the end, you need a good persona review! 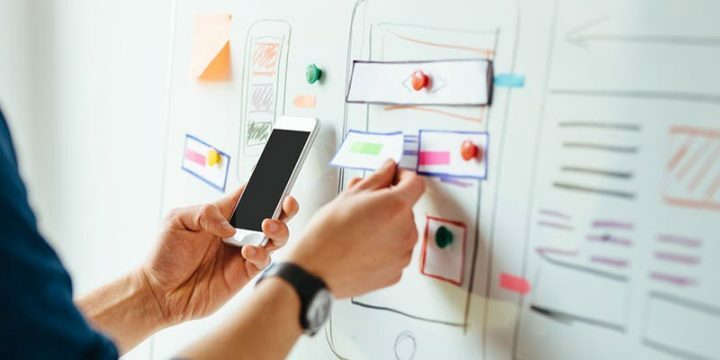 We can avoid most of the controversial pitfalls in user personas for UX design we mentioned by keeping some rules of thumb in mind. Let’s see! Have you verified your personas? Just to emphasize again: Do the research before creating the user personas. Do not get stuck on the prototypes. You might very easily assume you know the potential users, especially if you yourself could serve as one. But those personas represent assumptions and verifying them first can result in a better product. As mentioned, personas change over time. You get to know more about your users as they start using the product. 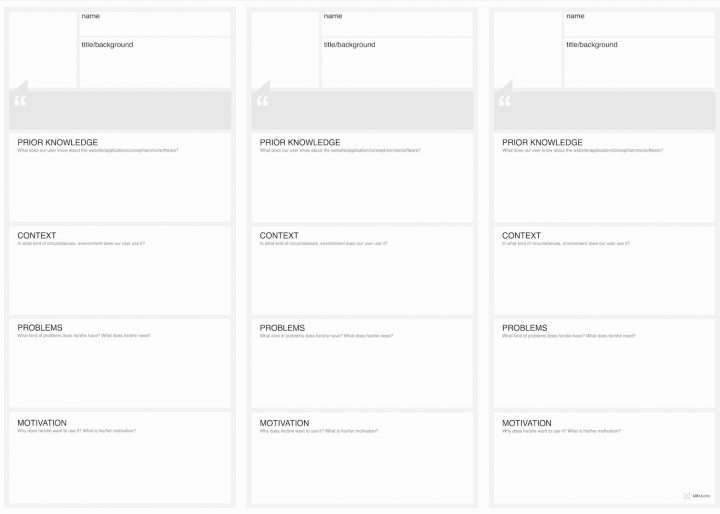 View the persona creation process as iterative. Did you choose the best categorization method? We might also easily characterize personas in the most convenient way. For example, in the case of an app for patients and doctors, segment them as such, based on their roles. But many times, checking again can prove useful. Maybe their motivations or background knowledge categorize them better. Does the persona prove useful to the design process? If your user personas reflect the actual product use and you feel they answer all your questions, great! Good job! If you find them too abstract and not connected to the product, check back again. Maybe you could characterize them from a different angle? But also, do not use too much imagination – do not think untrue things into the personas. Take them with a grain of salt. Remember to always verify first assumptions with research! Really get to know the users! Have three to five user personas, not more! Use alternative methods if the product requires! Once through the process of creating personas, map their user journey next. Read more about customer journey mapping here. Additionally, don’t forget to do some usability tests along the way!